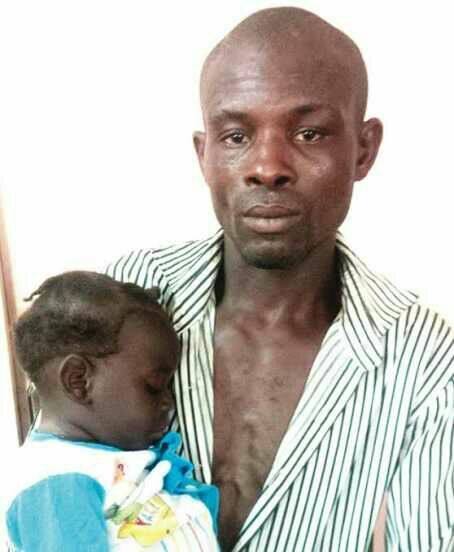 Lagos police nab suspected kidnapper for stealing 7-month-old baby [PHOTO] - BlogIT with OLIVIA!!! One Happiness Umah, a suspected child kidnapper who allegedly stole a seven-month-old child, Favour, in the Ijora area of Lagos state,has been arrested by the State Police Command.Umah was intercepted by officials of the Rapid Response Squad, RRS, while reportedly escaping with the child. The RRS officials were said to have queried him on where he got the child. Initially, Umah claimed he was her father but later said he picked her from a bush where she was crying.The suspected kidnapper was subsequently arrested by the police.The Police Public Relations Officer, PPRO, SP Dolapo Badmos, confirming the incident, saying,“The mother and her child live in the Railway area of Ijora.“The man was going with the child when he was arrested by the RRS operatives and questioned.When he could not give a satisfactory response as to where he found the child, he was arrested. “The command will not give room for miscreants to perpetrate crime in the state. We will continue to do our best to make Lagos crime-free,” the PPRO added, noting that ‘investigations are ongoing to know why he stolethe baby.’The case has been transferred to the Gender Office of the Command,” Badmos stated.According to report, investigations revealed that the child was stolen from her mother. A source who spoke with The Punch, said, “RRS officials who were on routine patrol at Eric Moore, Surulere, at the weekend, intercepted the man with the child.“When he was queried on how he came about the child, he first said he was her father. Later, he changed his story and said he picked her up from a bush while she was crying.“He said he was taking her to a police station in Bode Thomas when the police intercepted him. It was obvious that he was lying because there is a police station a few metres away from where he supposedly picked up the child.“He changed his story and said other things, which made the RRS men to send him to the command headquarters,” the source said.The police later took him to the Ijora area, where the child’s mother, Patricia John, was found.Patricia reportedly said her child was stolen while she was away.She was said to have left the child in the room and went out to buy something and by the time she returned, the child was gone.Reports say she had searched everywhere for her.The PPRO disclosed that the mother and her child had been reunited.